I call this a tweetle beetle bottle puddle paddle battle muddle (my apologies to Dr. Seuss). Sorry folks. 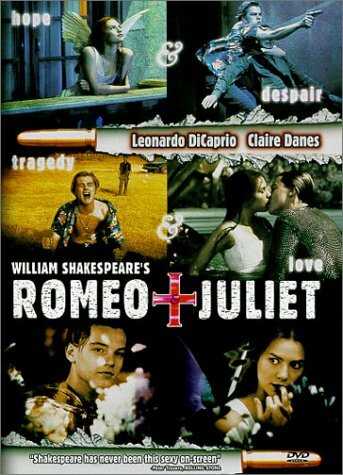 Romeo + Juliet with Leonardo DiCaprio and Clare Danes… it just doesn’t work for me. The setting is fair Verona Beach, Florida, circa 1996. The vibe is MTV meets video game meets acid dream… lots of frenetic movement, shouting, shooting, dizzying camera work. Oy vey. The language is Shakespeare(ish). Other than Father (not Friar) Laurence (played by Pete Postlethwaite), the lines are delivered like a cold reading in a high school English class (when they’re not yelled). Do any of the actors know what the words mean? On the bright side (literally), the film was nominated for an Oscar for Best Art Direction-Set Decoration. I can see that… the sets are brightly colored and interesting. Water images throughout the film caught my attention. Not sure they worked for me, but they got me thinking. We meet Juliet (Danes) as she’s soaking her head face down and eyes open in a basin of water, hair floating all over the place. Interesting way to introduce her. Not sure what it meant. Romeo (DiCaprio) similarly dunks his head in a basin during the psychedelic Capulet party. Whew. Needed to clear his head a bit there! The balcony scene drops down to the swimming pool, so more water images here. And (maybe effectively?) Juliet literally “takes the plunge” and tackles Romeo into the pool as she affirms her love for him. Then, after their marriage and night together, Romeo escapes by jumping into the pool as Juliet’s mother enters the bedroom. She doesn’t seem to notice the big splash. The last we see of our star-crossed lovers is an after-death montage that includes again the footage of the underwater (over their heads?) lovers in the swimming pool. You never know! When I was a kid, one of the Shakespeare productions (I forget which play) my mom and I saw was very modernized and I remember they drove motorcycles up onto the stage. It got in the way for me at the time (maybe because it got in the way for my mom, and that colored my view). Anyway, at this point in my life my views on everything pretty much change day by day, so… I don’t doubt I could come back to this one some day and see it differently. Hate it, but I’m planning to watch it again soon. It’s in my Netflix queue along with Luhrmann’s other films. I want to see if I like it better in the context of his other work.